Behold!–a Camel thrust his face. In leaped the whole ungainly form. For food historian Mark Kurlansky the advent of bottled salad dressing represented the ‘camel’s nose’ of industrial food slipping into American kitchens. “What could better spell the beginning of the end than bottled salad dressing, the manufacture of a product that was so easy to make at home?” he writes in The Food of a Younger Land (2009). To a significant degree we have allowed industrial foods to displace homemade ones. But there are ways to begin nudging the camel out of the kitchen. One of the easiest strategies for retaking the kitchen from prepackaged and processed food is to make fresh vegetables in simple forms that are delicious. 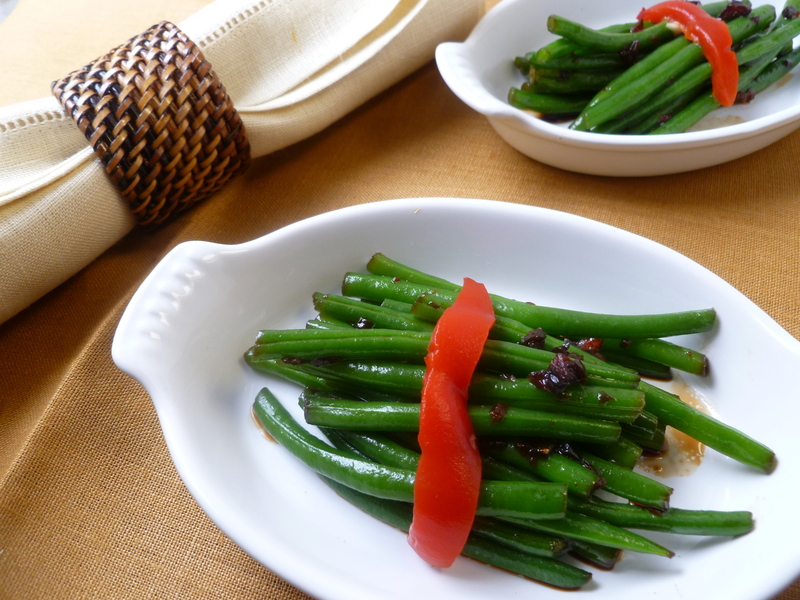 Cooking Balsamic French Green Beans is an excellent tack for sending the camel packing. 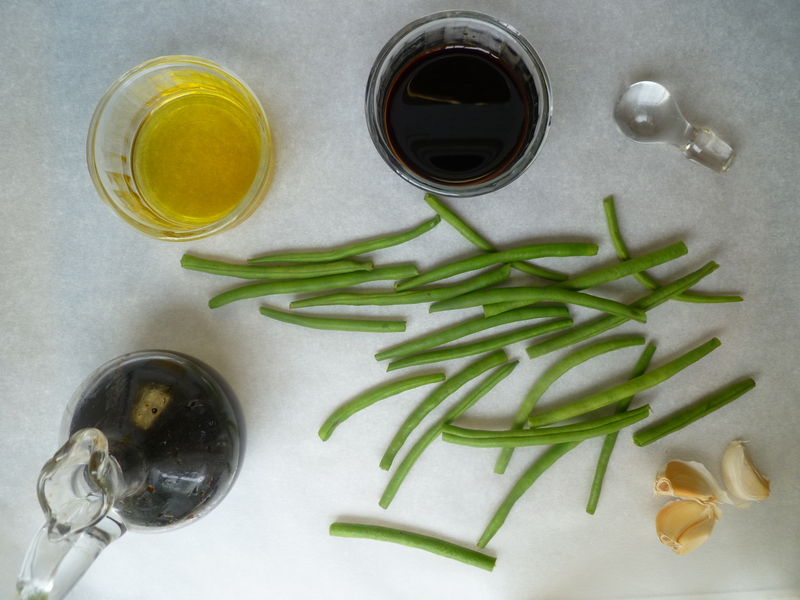 A Timing Note: The beans may be blanched in advance and set aside in a bowl of ice water for several hours. 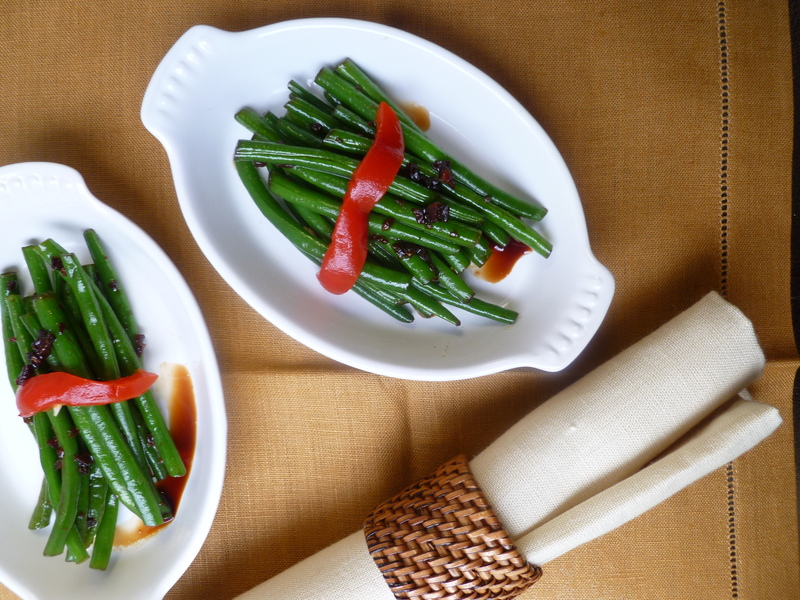 The sauce may also be made in advance and both beans and sauce mixed together and cooked very briefly just to heat the beans before serving. 1. 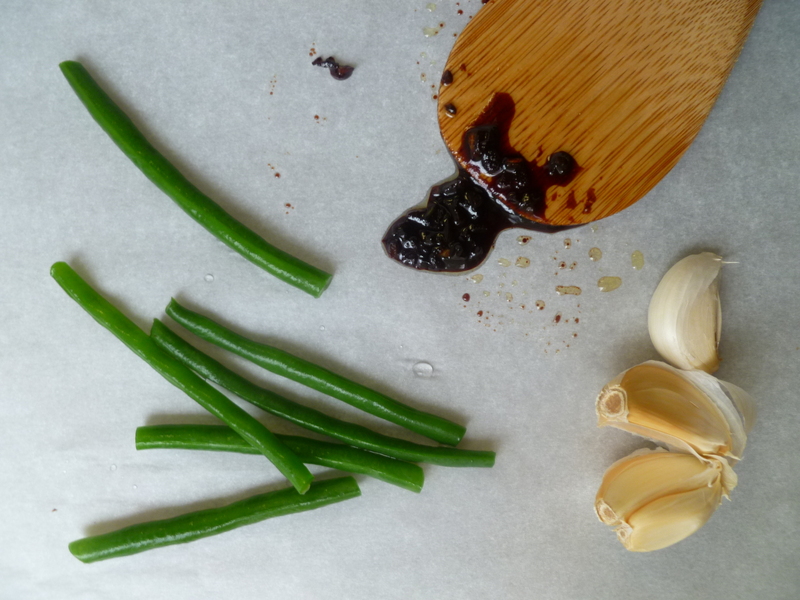 French green beans are stringless. Trim off their tips…and they are ready to cook. 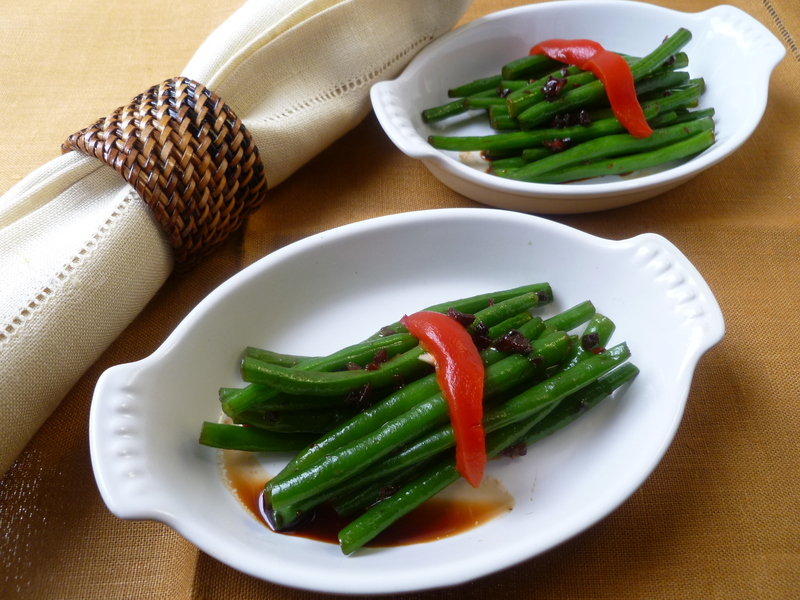 Photographs of trimming haricots verts are here in a previous diplomatickitchen post. 3. 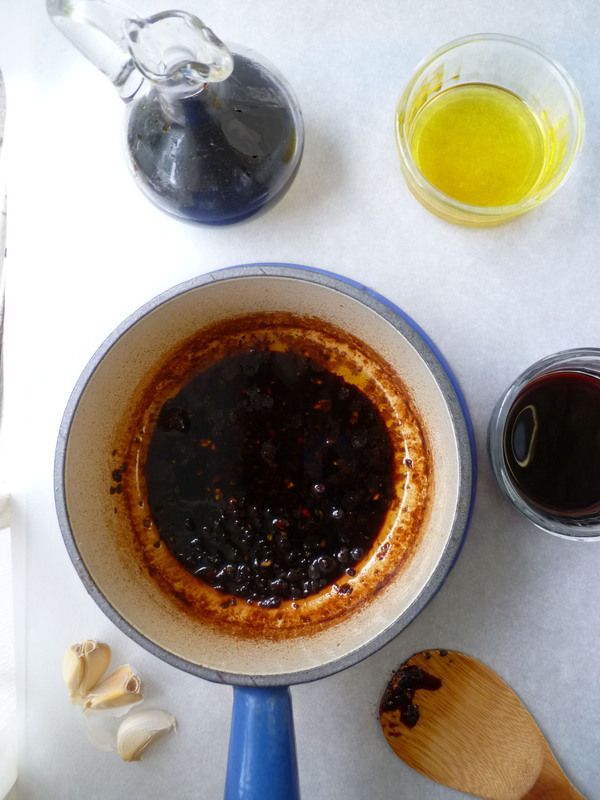 Whisk together the soy sauce, balsamic vinegar, sugar and sesame oil in a small bowl. 4. Heat the sesame and olive oils in the heavy-bottomed pot. Add the garlic and sauté it, stirring, until it begins to color and turn golden. 5. Add the sauce mixture to the pot and cook it over medium heat to reduce it. As the sauce begins to reduce, little patches of sizzling bubbles will appear on its surface. The entire surface of the sauce will be a bubbling mass when the sauce is almost ready. The finished reduction…. Last Touch: Roasted Red Pepper Strip Redux…. 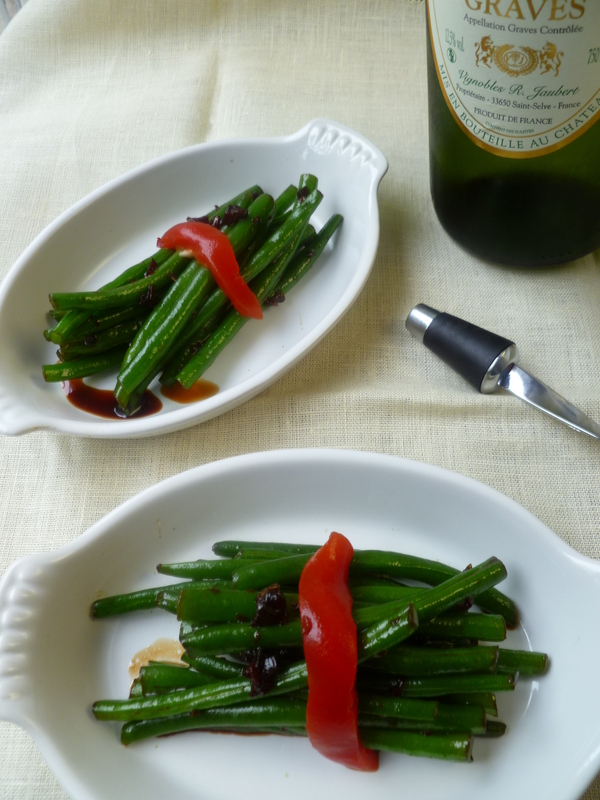 A Note: Balsamic French Green Beans are served with the Main Course of Salmon ‘au poivre’ for the Dinner: Mixing Dinner and Business.